Add a little twist to these brand boosting Customised Tangles with your very own company printing and personalisation prior to handing them out as much as possible. Help to increase your advertising capacity by giving away lots of our Customised Tangles stamped up with your company details. They are available in all sorts of colours and when given out to your customers and clients these Customised Tangles will prove a very effective advertising tool. 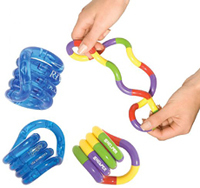 The plastic Customised Tangles can be twisted and turned to form all sorts of shapes. When placed on a desk it is constantly used as a stress reliever or just a way to pass a few moments whilst perhaps holding on the phone. So as soon as these are picked up, your details are there in full view constantly. There is no beginning or end and no right or wrong way to use this and people of all ages will not fail to be tempted to pick it up and play with it. Don't get tangled up with advertising jargon. Give us a call today and we'll do the rest for you! To find out more about other novelty gifts besides our Customised Tangles click here. To find out more about our Customised Tangles click here and fill in the contact form and we'll get straight back to you. Other promotional and personalised items besides our Customised Tangles click here.